Unlike anything that has come to the market, this split-level penthouse residence offers executive-style living with one of Brisbane's best panoramic views. With four bedrooms, three bathrooms and exclusive access to resort style facilities, this residence truly takes contemporary luxury to rarefied heights. Occupying an exquisite 437m2 of floor space at the top of the iconic "Coronation Residences" you will discover the grandeur of inner city living from the moment you enter. Arriving at the iconic residential development through an ornate porte-cochere, the magnificent foyer leads through to the elevator banks that will take you skyward. The lower floor of the residence presents the very definition of height and space. A unique double curve feature wall and soaring 6m ceiling, with tall double-glazed glass doors, creates a loft, airy environment. The open plan living areas lead directly the timber outdoor deck overlooking the city. A flawless entertaining space, the deck features a mains gas barbecue and in-built sound system. The exquisite gourmet kitchen has quality Miele appliances, Oliveri stainless steel dual sink set in a vast limestone bench, all framed by a stunning glass splashback. The adjacent dining area treats your dinner guests to uninterrupted panoramas of the CBD from expansive windows. Also located on the lower level are a study with included furniture, bedroom with ensuite, powder room and a spacious laundry and packing area. The top floor of the residence features the master bedroom suite, commanding magnificent views of the city. Luxury and comfort are further enhanced by a luxury ensuite, with frameless shower screen, limestone vanity tops and brown Emperador marble tiles. The centrepiece of the bathroom, the spa bath, boasts brilliant views over the river and a well-appointed walk-in robe completes the space. Two additional bedrooms are serviced by a large bathroom with the same quality finishes and spa bath, as well as a laundry chute for additional amenity. Living at the penthouse also gives you access to three secure garage car parks, plus an open storage space large enough for a fourth small car. The basement also features two additional secure storage areas. Located within the Coronation Residences on the river's edge, this residence has direct access to the complex's exclusive resort-style amenities. These include a luxurious 25 metre lap pool and spa, fully equipped gymnasium, barbecue pavillion and entertainment areas. If you need more space, treat your guests to an event in the multipurpose function room, complete with kitchen facilities. For a more relaxed occasion, wander in the landscaped grounds, or find introspection in the sculpture/reflection court. This residence gives you the perfect perch from which to experience all that Brisbane has to offer. Minutes away by foot are the restaurants and boutiques along Park Road, the Milton Markets, bus stops, ferries and train stations. Living in the inner city does not have to compromise on the comforts of home. 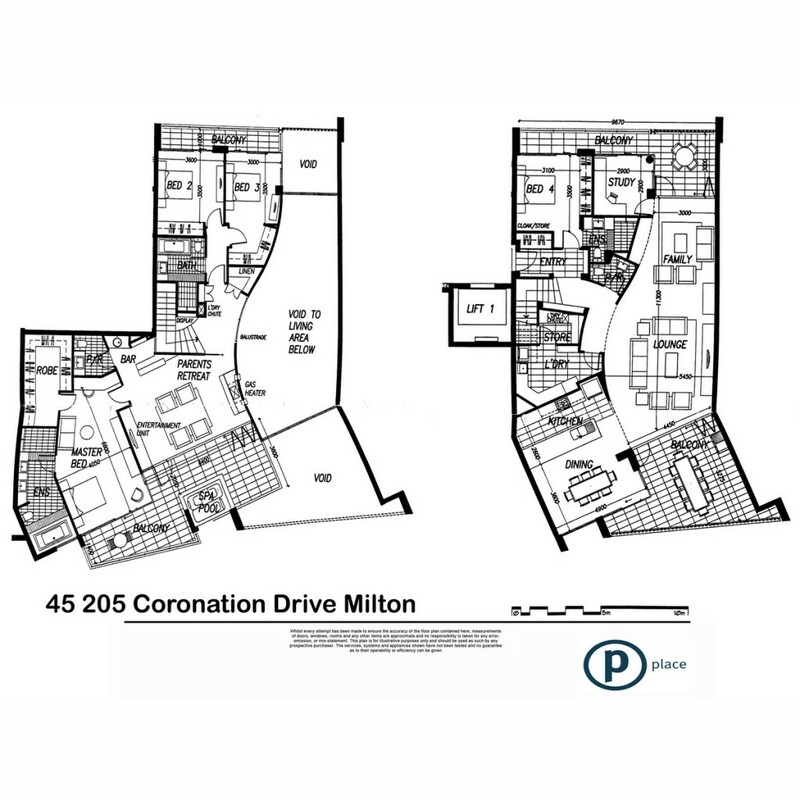 If you seek an executive lifestyle that exudes elegance, warmth and overstated sophistication, the penthouse at Coronation Residences is calling.